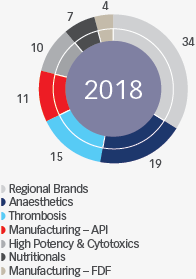 Strong organic growth from Commercial Pharmaceuticals of 8% on a CER basis with the Thrombosis and Anaesthetics portfolios being the main contributors. Commercial Pharmaceuticals revenue in Emerging markets* and Developed markets* grew 12% and 2% respectively on a CER basis for the period. Declines in Manufacturing and Nutritionals revenue offset the strong Commercial Pharmaceuticals growth. Group revenue increased by 5% on a CER basis. 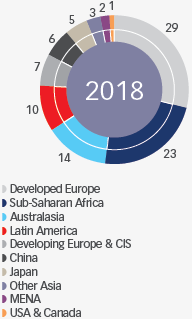 * Developed and Emerging markets as defined by MSCI ACWI Index and Frontier Markets Index. Normalised headline earnings per share (“NHEPS”) (up 10% on a CER basis) comprises headline earnings per share adjusted for specific non-trading items and is a measure which provides clear comparability of the financial performance of our ongoing underlying business. Growth in normalised EBITDA* of 5% coupled with lower net financing costs augmented the growth in normalised headline earnings. * Normalised EBITDA comprises operating profit before depreciation and amortisation adjusted for specific non-trading items defined in accounting policies of the Group’s Annual Financial Statements. Normalised EBITDA, comprising operating profit before depreciation and amortisation adjusted for specific non-trading items, grew 5% (up 5% on CER basis) assisted by underlying positive organic growth in Commercial Pharmaceuticals and the margin benefit arising from the acquisition of the residual rights to the AstraZeneca anaesthetics portfolio. 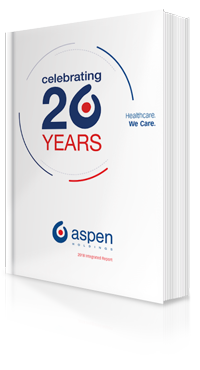 Declared after taking into account earnings and cash flow performance, debt service commitments, the expected completion of the divestment of the Global Nutritionals Business, future proposed investments and funding options.